Any Beverage. Served Perfectly. Any Where. Any Time! SlushTender™ - The patented and patent pending SlushTender is a battery operated insulated portable dispenser designed to distribute frozen slush beverages. The SlushTender is a bar or tabletop unit which can maintain up to 3 gallons of frozen slush beverages at ideal serving consistency for 4 hours or more. Utilizing ThirstEnders' patented technology the SlushTender can be easily converted for use in the SlushPack. The SlushTender, SlushPack™, SlushBlender™ and SlushMobile™ are all components of the SlushSystem™. 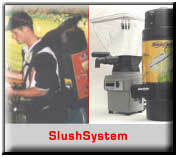 SlushPack - The patented SlushPack is a battery operated backpack dispenser designed to distribute frozen slush beverages. This unique and exciting system provides, for the first time, a proven method to deliver slush beverages remotely in the stands or crowds. BevPack™ - Our Original BevPack backpack system is designed to distribute hot or cold carbonated or non-carbonated beverages. GravityPack™ - The GravityPack is a backpack beverage dispenser designed to distribute hot or cold non-carbonated beverages. In its optional FullFlow™ configuration, the GravityPack easily dispenses high viscosity beverages such as orange juice or soups. BottlePack™ & CanPack™ - Our BottlePack and CanPack backpack systems were initially designed for vending prepackaged, chilled bottles and cans of beverages. In addition, specially modified versions of these patented systems have proven to be effective in selling food and consumer products. IconPack™ - The patented IconPack is an innovative and exciting system that incorporates all of the above described backpack systems. The IconPack is designed around the existing backpack systems such that the container portion of the backpack looks like the product being served. For example, the PeanutPack™ looks like a large peanut. See BackPack Comparison Chart for a summary of the features of these backpack systems. SlushBlender - Developed to support the SlushTender and SlushPack, the SlushBlender is capable of making 3 gallons of frozen slush beverage in approximately two minutes. SlushMobile - Also developed to support the SlushPack, the dynamic sampling and promotional SlushMobile is a support trailer built to provide a complete mobile staging system for the SlushSystem. MobiCan™ -The MobiCan is also a support trailer designed to support any of our backpack systems. "Budweiser", "Bud" and "Bud Light" are trademarks of Anheuser-Busch. "Kahlua" and "Kahluacinno" are trademarks of Allied Domecq. "Pepsi" and "Mountain Dew" are trademarks of the Pepsi-Cola Company. "Danone" is a trademark of Danone.